PlayBox HD app for iOS crawls out as a great alternative to Popcorn Time and MovieBox, a good news to those Popcorn Time fans who get tired of Popcorn Time iOS jailbreak since the iOS version PlayBox HD for iPhone iPad delivers a free way to download movies to iPhone iPad with multiple languages supported, requiring no jailbreak. Maybe it’s just a matter of time for PlayBox to beat off its great rival, Popcorn Time. I trawl through the web and bring you the guide to download install the app on iOS 12 for consuming something on the go needless of shelling out any money. Plus, PlayBox HD not working on iOS, like unable to download or install, is also fixed here. Feel troublesome to download the app on iOS or encounter any issue with it? Needless to feel frustrated! You can resort to best Playbox alternative --- MacX Video Converter Pro to free download movies from YouTube, Dailymotion, Facebook, Pandora TV, etc. 300+ movie video sharing sites with 720P 1080P, 4K 8K UHD, 3D Blu Ray, etc. in mins. 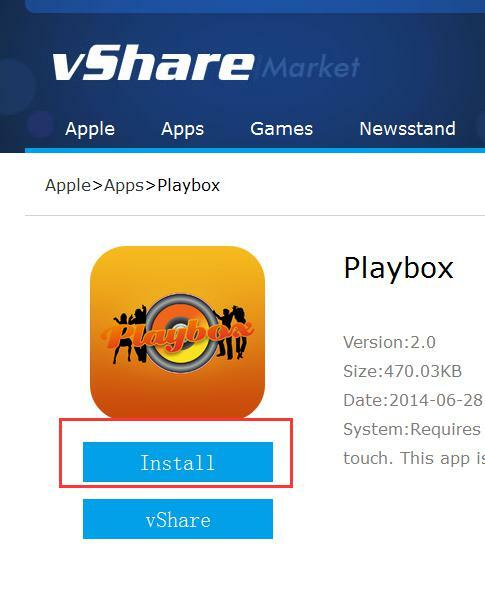 1. to download iOS version of PlayBox, go to vshare.com. 3. and follow the prompt, click "Install". After the installation process is done, you have to wait 24 hours for the activation procedure to complete. The app offers Kids mode for children, you can go to Settings to turn on or turn off the Kids mode. Note that some users complain they can't download and install PlayBox app on iPhone iPad. No worries, I'll explain it later in the Part on PlayBox not working on iOS. PlayBox HD for iOS Not Working Fixed! 1. "Moviebox for some reason is really slow for me. I can't even stream or download anything because the speeds are really slow. So i wanna resort to iOS version of PlayBox HD app, but it's not installing,any help?" If you can't install the app on iOS without jailbreak, try it again later. It works for many users. If you download PlayBox HD for iOS iPhone iPad via vShare, do not restart your device, otherwise, you have to reinstall the apps installed through vShare. If you have questions about MovieBox issues, my previous post MovieBox not working may help you out. 2. "Playboxhd.com is not working on my iPhone 8.1.4, why?? When I go on the site, I don't see any links to download install it on iOS 12 at all. I just get a description of what the app is and the upgrade version, and an email address to contact them with. What's going on??" You can download PlayBox HD iOS app for iPhone iPad via app sites, like vShare, as I suggest above. Of course, if you have any problems or questions unable to resolve, you can send an email to 'playboxhd.com@gmail.com' for help. 3. "I own iPhone 6 plus, and I got PlayBox app for iOS working yesterday, and I did the app update not even thinking it through 100 percent ...... Now I can't open it any more. iOS 8.1.3. HELP!" According to the official word, you should roll the date back to Jan 1st, open the app. Then, revert the date back. It will help. Tips: iOS 9.3 is now available. If you encounter the same problems of PlayBox HD app on iOS 12, gengerally you are able to solve it in the same steps. Be it PlayBox HD without jailbreak, MovieBox or Popcorn Time, it's all a bit of a cat-and-mouse affair getting them running on your iOS devices. It is hard for them to appear in the App Store, Apple surely forbids and will catch up new method to crack them down. Downloading PlayBox HD for iOS iPhone iPad, or Popcorn Time is reliable. Jailbreak aside, bothapps is a hit and miss. MacX Video Converter Pro, a smashing video downloader, may be the strongest rival to PlayBox HD, or Popcorn Time, or the likes. The video downloader is able to download any free full movie in 1080P, 4K UHD from over 300 sites, YouTube, Dailymotion, Vimeo, divxcrawler.to etc. in a blazing fast speed, yet with intact video quality. You just need to copy and paste movie URL, the ease of use is also quite surprising. Moreover, you are free to download songs videos to your iPhone SE/6S/6S Plus, iPad Pro for playback or making iPhone ringtone.